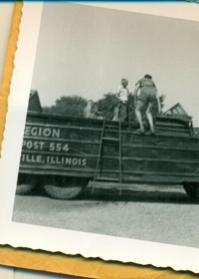 What was one way members of Post 554 in Illinois traveled in the 1950s? Q: What was one way members of Post 554 in Illinois traveled in the 1950s? A: With an amphibious truck first developed during World War II. According to the post’s page on The American Legion’s Centennial Celebration site, by 1954 Guy Baird Post 554 in Carlinville, Ill., had possession of the vehicle (known as a Duck) as surplus from the war, and post family members likely enjoyed it at places such as nearby Beaver Dam State Park. It was ultimately donated to another local organization. Find more Legion stories at www.legion.org/centennial. Want to share the important moments of your post?